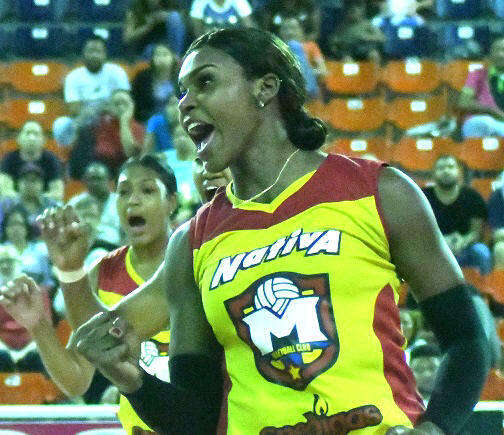 SANTO DOMINGO, Dominican Republic, March 21, 2019 – Bethania de la Cruz raked up 25 points as Mirador overcame Cristo Rey 3-1 (20-25, 25-10, 25-10, 25-21) to take a slight lead in first place of the standings of the Dominican Women’s Volleyball League on Wednesday. Mirador now has a 6-2 win-loss record with 26 points with one more match to play in the regular series. Cristo Rey 5-3 (24) and Caribeñas 5-3 (22) share the second position. Natalia Martinez had 16 points, including five aces, and Yanlis Feliz added 14 in the victory. Madeline Guillen scored 15 for Cristo Rey. In the other match of Wednesday, Caribeñas edged Guerreras 3-2 (22-25, 25-19, 20-25, 25-21, 15-13) behind a 28-point performance by Lisvel Eve while Erasma Moreno contributed 18 points in the victory. Dahiana Burgos and Jeoselyna Rodriguez had 18 and 17 points for the winless Guerreras 0-8 (8) while Niverka Marte and Joanna Montero each had 11. The regular series concludes on Friday with a doubleheader featuring Mirador v Caribeñas followed by Cristo Rey v Guerreras.